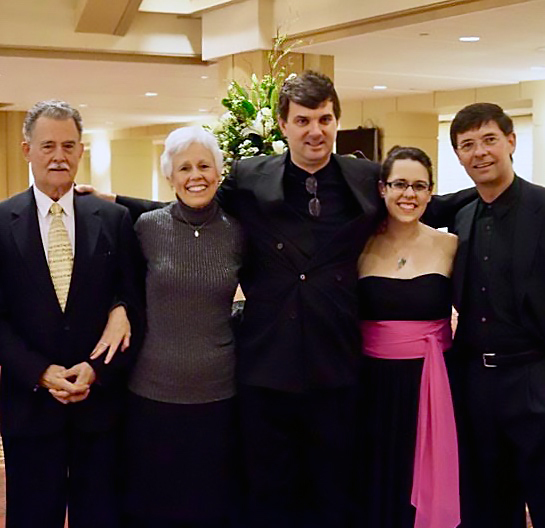 On our next Winsor Music concert on March 16, my parents, brothers, and I will be performing together as a family for the first time in Boston! Each one of us has deep ties to Boston and the music scene here, and I am so excited to introduce my brothers to the Winsor community. People often ask me what it was like to grow up in a family of musicians. Music was everywhere in my childhood, some of my oldest memories are of playing underneath the piano while my parents rehearsed. My parents and I played and listened to music constantly. I’ll never forget the sound of my dad remarking on my practicing, “Out of tuuuuuuune” as he chopped carrots in the kitchen. In addition to my parents, I had two musician brothers to look up to. When I was just starting to play, they were well on their way to phenomenal careers as performers. The closeness of my family is due in a large part to our relationship with music. The three string-player kids, me, Andres, and Roberto, all had our first moments on our instruments guided by our father. His deep connection to music influenced us all from the very beginning. The road to a life in music was a rather bumpy one for him, and I thought I’d share a little bit of that story with you. 1) He must take it seriously and practice. 2) He would have to get a degree in something else first. My dad agreed and the violin was his. Pop was very serious and creative about music from the beginning. He was given a recording of Rimsky-Korsakov’s Scheherezade but had no record player, so he made his own out of a little motor, a cone of paper, a violin bow stick, and a cactus needle! Pop obtained his degree in mechanical engineering while also completing a music performance degree. 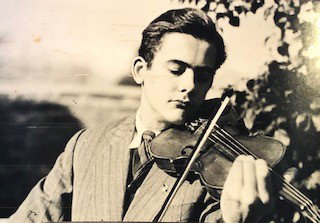 After graduating, he began life as a professional musician, performing the Chilean premieres of concerti by Bartok, Hindemith, Berlioz, and Walton. 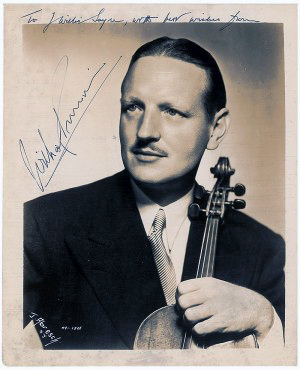 William Primrose, an inspiration to us all! After his Fulbright was complete, Pop and the family returned to Chile, where political tensions were high. He knew that he did not want to stay in the collapsing country, and wanted to return to the United States. While playing with the Chilean Chamber Orchestra he got to know the great American composer Gunther Schuller. Pop asked Gunther if there was any work available to him in the States, and Gunther contacted his friend Robert Shaw, conductor of the Atlanta Symphony. Mr. Shaw graciously allowed my father to join the orchestra as long as he was in the American Musician’s Union, luckily he had joined so he could play some gigs while living in Bloomington. Pop immediately traded their car in exchange for plane tickets, and landed in Miami on September 11, 1973, the day of the Chilean coup. Once in the States, Jenny, Roberto, and Andres were all interested in music and took lessons from their parents. Tragically, Pauline was killed in a bicycle accident a few years later. Now a single father, my dad continued to play in the Atlanta Symphony and took odd jobs on the side to support his family, like a paper route and repairing old cars. Pop’s engineering degree proved beneficial as he soon got work as a draftsman. Jenny focused her interest in fashion and cosmetics and decided music was not for her. 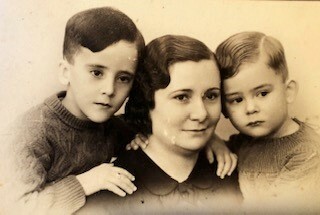 Roberto, then a violinist, and Andrés, a cellist, became quite serious about music. They both decided to go to music school, and moved to Boston to attend the New England Conservatory of Music. Around this time, my dad met and married Betty Anne, a fabulous pianist, and I came into the picture. My mom, a Georgia native, studied with incredible pianists Menahem Pressler, William Masselos, Edward Kilenyi, and Lee Luvisi. Her beautiful, soulful playing fit right in with the Díaz boys. After completing their schooling at NEC, Roberto became a member of the Boston Symphony, and Andres won the Naumberg Competition and toured worldwide as a soloist and chamber musician. I had just started playing the violin and piano, studying with my parents, and I remember thinking how amazing my older brothers were. They would always play for me when they came home for holidays, and I absolutely loved listening to them practice. Roberto would send me presents from the exotic places he traveled to on tours with the Symphony and the Boston Pops, and Andres would tell us hilarious stories about places he played and the people he met, like the time a violinist went missing during a rehearsal and was found later stuck high up in a tree! They would send us cassette tapes of their concert performances, and I would secretly listen to them every night under the covers on my walkman. I would listen to certain pieces they played, like the Dohnanyi Serenade, over and over again until I knew exactly how every moment of the music sounded. I hoped that some day I might be able to play with them. When I was 16, I was diagnosed with Hodgkin’s Disease, a type of lymphatic cancer. This difficult period in my life solidified my need to become a musician. Music was a release for me and no matter how crummy I felt, listening to music always made me feel better. After about a year of chemo and radiation, I was healthy again, and it was time to think about college. There was no doubt in my mind I wanted to come to Boston to attend NEC. By this time, Roberto had moved away and was now principal viola of the Philadelphia Orchestra, and Andres was teaching at Boston University. I started school, and in the years following Andres moved to Texas and began teaching at SMU, and Roberto became President of the Curtis Institute of Music, the prestigious music school in Philadelphia. Jenny went on to an impressive career at Neiman Marcus, where she is a top saleswoman for Chanel. A few years ago, my mother was diagnosed with breast cancer, and during her treatment and recovery she worked on Bach’s Goldberg Variations as a kind of personal therapy. Once she was healthy, my brothers and I performed a string trio arrangement of this great work to benefit the cancer center in our home town. Fun times with big brothers! Three years ago, after retiring from teaching, my parents relocated to Winchester! Although Boston is quite different from Columbus, Georgia, they have settled in and are enjoying Boston to the fullest. My mom has gotten to know a wonderful singer and is playing the great Lieder repertoire with him every week, and my dad has joined the Longwood Symphony. They are avid concert-goers, and I love hearing their opinions on the concerts they hear every week. Our Winsor concert on March 16 is going to be a fun one! The bros will play a piece I have heard them play many times and love hearing them play, the charming “Eyeglasses” duo by Beethoven. The three of us will play epic trios by Beethoven and Dohnanyi, and my parents will join us in a new Song for the Spirit by a local favorite composer, Marti Epstein. We will teach this song to the audience, and then we will all perform it together, bringing the Winsor family so dear to me and the Díaz family together. Throughout the many twists and turns in the Díaz family history, music has been a constant source of joy, relief, and bonding. It has been quite a journey from Spain to Boston, but through it all my family stayed connected through the joy of music-making. We are so looking forward to playing together again and I hope you will be able to join us!! For the last two weeks, our Artistic Director Peggy Pearson has been at the Wellesley Composer’s Conference, one of the oldest and most prestigious conferences of its kind. James Baker is Music Director and Conductor of the Composers Conference at Wellesley College, and he very graciously took some time out of his jam-packed schedule this week to speak with us about his love of new music, his work at the conference, and his unique vantage point as a percussionist, conductor, and composer of electronic music. This Sunday, July 12, host Brian McCreath interviews oboist Peggy Pearson and composer John Harbison on WCRB’s The Bach Hour about Lorraine Hunt Lieberson and her performance of Cantata 170 on the recording we released last fall. Spring Benefit — Thank you! In my first weeks with Winsor Music, I have had the opportunity to work with Violobos. Leading up to the benefit, I never had any doubts that they would give anything less than a fantastic performance. Happy summer, friends! We're delighted to welcome to new interns to Winsor Music this summer, both from Smith College in Northampton, MA. Meet Tricia Kopko and Sarah Netsky! New CD of Bach arias and duets now available! Order here.